They come to Toledo from the far reaches of the globe – from the nations of northern and sub-Saharan Africa and from Europe; from the largest country on earth, from the coldest major city on earth, from the smallest nation in Asia, from the most populous nation in Asia – indeed, the most populous nation in the world. They are students from around the globe spending an academic year in Toledo, studying at local schools, enjoying what their encounters with local people, local food, local customs. To a person they are greatly improving their command of English. 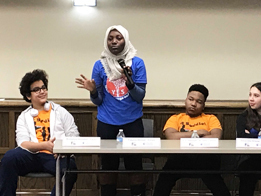 On Saturday, March 30, ACES (the American Cultural Exchange Service) and Books4Buddies hosted a gathering of these visiting teens with the help of Toledo Public Schools and the Toledo Lucas County Public Library at the West Sylvania Avenue Branch. The visitors had the opportunity to share their experiences with Books4Buddies Ambassadors and the invited public during the second annual Youth Global Perspectives. The event was organized by Tracee Ellis, ACES coordinator, and Laneta Goings, president Books4Buddies and facilitated by TPS’ Candice Harrison and Tony Geftos of 13abc. “I love Americans,” said Evlizy Alfandega of Mozambique, expressing a sentiment echoed by a number of the exchange students. “They are so good; they are so kind. I love the food.” Evlizy, who is spending this year at Bowsher High School, explained that when she applied for a scholarship for the ACES program, her knowledge of the country was pretty much limited to the big-named cities of the East and West Coasts. Being told that she would ne headed to Toledo, OH brought about a certain amount of confusion. Aytalina Struckhova, who is at Lake High School this year, hails from the coldest major city on Earth, Yakutsk – a Russian town so far east in the world’s largest country by area that it’s a seven-hour flight from Moscow, the capital. “I love everybody that I have met here,” she said. She also noted that she appreciates the relatively warm Toledo winters!! Also from Yakutsk is Maria Zemskova, who has also basked in the Toledo temperate climes. From Thailand comes Natyama Paduka, who spoke of being in the Muslim minority in that country, as she is in America, but expressed her appreciation for the fact that “the life here is so good.” Natyama also spoke of advice she had been given about the task of an exchange student – explaining Thailand to Americans and, later, explaining America to her Thai countrymen. Muhammadjon Saidov from Tajikistan, “the smallest country in Asia,” he noted after listening to Russians speak of the great size of their native land. Refiloe noted that she has been particularly impressed by the way Americans take to heart their duty to spend time on community service – an obligation not in vogue in her homeland, but one that she wishes to instill in her fellow citizens when she returns. As much as he is enjoying his experiences here in America, Sheheryar Saidov of Pakistan did point out the one thing he misses. “Spices,” he said to the amusement and agreement of the other students from warm climates. Here, in America, said Sheyeryar, people think that spicy means only “hot sauce.” After the laughter subsided, he explained that he could name 11 spices that the cooking here in America lacked in general. Other students present for the gathering were Mohamed Abdallah from Egypt, Fatuma Ahmed from Kenya, Victor Bocquillon from France, Malika Kairatova Nur from Kazakhstan, Ashraf Khamis from Tanzania and Angel Zhou from China. Also present for the event were a number of Books4Buddies Ambassadors, home from college for the most part – Armand Arce, Tyson Robinson, Paul Thomas, Jr and Christopher Smith. Families interested in hosting one of the ACES International students can call 419-450-0631, email traceeellis.goglobal@aol.com or visit website exploretheworld.org.